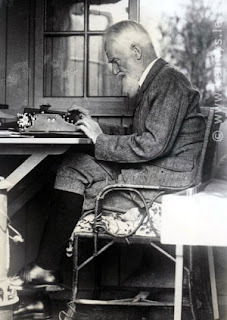 At twenty-five, George Bernard Shaw became a vegetarian. He attributed this change in lifestyle to a couplet in Percy Bysshe Shelly’s poem, The Revolt of Islam. The less romantic among us attribute this conversion more to poverty than to poetry. Still, Shaw remained a lifelong vegetarian and a teetotaler. He married late in life and his wife kept to his strict dietary requirements. When entertaining, one maid served the carnivorous, wine swilling guests while Shaw had his own maid to serve him. After his wife died, Shaw needed someone to continue the regime his mother and then his wife meticulously carried out. He found a willing servant in Alice Laden, a widow who nursed his wife during last eight months of her life. Though she didn’t wish to live in the country, to Shaw’s great fortune she remained. 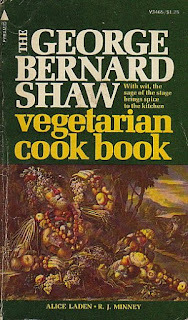 In later life, Alice Laden compiled many of the recipes she cooked for Shaw into the George Bernard Shaw Vegetarian Cookbook. I chose this recipe because my friend, Harry Lowe, loves shredded wheat. He also loves nuts. This dish is a perfect dish for him as he always has the ingredients in his cupboard! Preheat oven to 375 F. Crush the shredded-wheat finely with a rolling pin. Mix nuts, bread crumbs, seasonings, shredded-wheat, sautéed onions, and beaten eggs together in a bowl. Chop the hard-cooked egg and mix with the grated cheese and cooked rice in another bowl to form a firm filling. Add salt and pepper too taste. Spread half the nut-meat mixture in a buttered baking dish and spread cheese and rice filling over this. Spread the remaining nut-meat mixture on top and dot with butter. Bake for 45 minutes. Serve hot with Tomato Sauce.